looks like a great snack, and will certainly make them smile when they open the box -- the open-mouthed faces with hats are so funny! love the dragon fruit balls too, such a fascinating and stylish fruit. best of luck to your kids with the test!! 好可爱的小点心！我家的大不点这个星期也是final exam but they still need to carry over their school aft exam..5..5..5! omg, how did your crabstick cutouts come out so beautifully? Did you use a really sharp cutter or freehand? @凶妈妈 : All the best for your kid too! Hope our kids will do their best for the final exam. Thanks a lot 凶妈妈! @Kuusou : I do hope they will remember. Sometimes they know the answer but they don't look the question carefully. Thanks a lot Kuusou! @anna2003 : Enjoy your 'honeymoon' period. I will be join you soon hehehe ... Thanks a lot Karen! What is the 3 important points? So the 3 smiley face represent the points? Hope your kids are doing well in thier exam. So cool the dragonfruit! 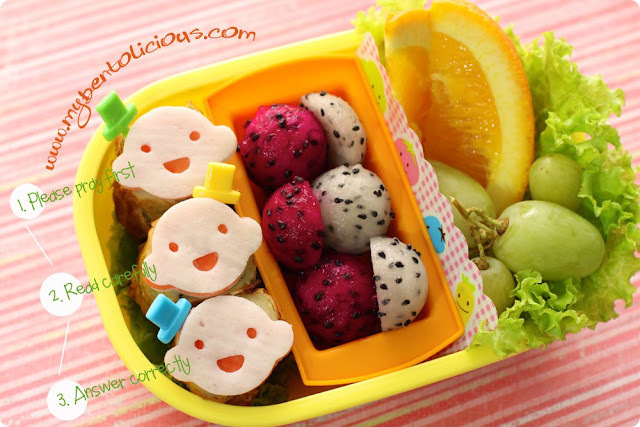 I would love the exotic fruit for my bento; perhaps I should try it. The three faces will remind them of the 3 important things... best of everything for the kids to do well in their exams! @Asfora : The pink dragon fruit sweeter than the white one. I used melon baller to make the ball shapes hehehe ... Hope you can find it and try it. There are very nice :) Thanks a lot Asfora! @tatabonita : Thanks a lot dear! i love the babies!! im sure you make your kids friends jealous of their lunches!